Audra Hughes has been trying to hold on to her life after losing her husband. Their son, Jack has been having terrible nightmares and Audra is at her wits end trying to figure it why this is happening. THE PIECES WE KEEP brings the past smack right into the present with Jacks nightmares. One day, while getting ready to fly to a job interview in Philadelphia, Jack seems very upset about having to get on the plane. Once on the plane, Jack has a major meltdown and the pilots decide to turn back and get Jack and Audra off the plane. Jack's nightmares get worse after that and while trying to calm him down Audra picks up bit and pieces of a mystery that goes way back to World War II. THE PIECES WE KEEP alternates between the 30's and 40's and the present with each chapter. A stunning story that you can't help but getting wrapped up in. I can easily see this being made into a movie! I loved all the characters and while my heart was breaking for some of them, I was cheering them on at the same time. 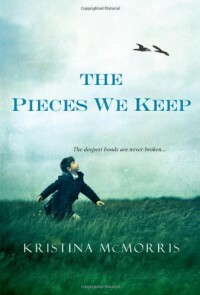 Kristina is one of my favorite authors and THE PIECES WE KEEP proves exactly why. I couldn't stop flipping the pages and couldn't wait until the mystery was solved. I had no idea it would end the way it did but I absolutely loved the ending. Five stars all the way! READ THIS BOOK!! !I will be doing a full review on Fresh Fiction!